The classic cult TV show, Lost In Space will be reaching its Fortieth Anniversary in 2005, and to commemorate this milestone event in pop culture history, upstart publisher, Bubblehead Publishing, is set to release a massive 360 page, full color graphic novel collecting and completing Bill Mumy's epic twelve part comic book adventure LOST IN SPACE: Voyage To The Bottom Of The Soul, a mega-story originally published in serialized form by Innovation Publishing in 1992-93 but left unfinished when the publisher went out of business. "It was a frustrating thing for me," says original series editor, George Broderick, Jr. "This was a body of work I was extremely proud to be working on... and then it just stopped when the Comics Direct Market crashed after the "speculator bubble" of the early 90's popped and we saw the untimely demise of many publishers, Innovation among them. I can't begin to imagine how Bill must've felt." Broderick, Jr. continues, "This was a series that touched all the bases with the fans. It had a tense, well-plotted adventure story without all the 'silliness' of the TV series... it had spot-on characterization by a writer who was there from the beginning and knew these characters best, and it even provided closure of a sort because the story begins with the Robinsons finally reaching Alpha Centauri... their original goal before they became 'Lost In Space'. Bill and I shopped it around to other publishers, but the licensing rights became 'lost in space' then, especially in light of the fact that the merchandising rights to Lost In Space had just been transfered to New Line Cinema. We finally had to admit defeat and put it behind us." That all changed in 2004 when John Severin, Jr., son of legendary comic book and Cracked magazine artist John Severin, came into the picture. John, along with business partner and sister Ruth Larenas, had the notion to complete the remaining six chapters of the story and, along with the original six issues, publish them under one cover. "It started out as my wanting to publish a retrospective of my father's work," said Severin, Jr. "I'd worked in and around the publishing industry for years, but had never dealt with comic books per se, other than growing up with them as just 'something my father did for a living'. As I was researching them, however, I happened to mention my plans to Bill Mumy who clued me in on the history of 'Voyage'. Something there resonated with me, so Bill put me in touch with Kevin Burns and Jon Jashni of Synthesis Entertainment who, in addition to being prolific film and television producers in their own right, now controlled the remake and licensing rights to 'Lost in Space' on behalf of Space Productions and the Irwin Allen Estate. Kevin was a big fan of the comic (having co-authored one of the earlier two-part Innovation LIS stories with Bill) and was happy to make this a reality. When we were able to reunite both the original editor, George Broderick, Jr. and the original artist, Michal Dutkiewicz, everything clicked and away we went." "This sounded like such a fun project, I couldn't say 'no'," added Ruth Larenas, "and Bill, George and Michal are such easygoing, fun guys to work with... and they have a real passion for the material. 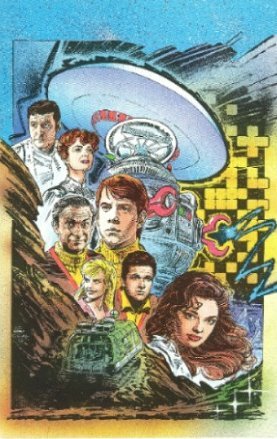 We'd still like to do a project celebrating my father's work, but as a first step into the world of comics publishing, you can't get much better than Lost In Space, especially when it's written by Will Robinson himself!" Current plans call for Bubblehead to release the graphic novel in July 2005 at San Diego's Comic Con International, to coincide with the Fourtieth Anniversary of Lost In Space, the TV series, but advance pre-publication sales of the book will be available on the company's internet commerce site www.lisvoyage.com. Finally, writer/actor/musician Bill Mumy adds "I'm working with some great people on this project. I'm so glad the original team is back to finish "Voyage to the Bottom of the Soul" properly. For over ten years fans have been asking me how this huge story ended, wanting me to print the unpublished second half of the scripts alone, but I didn't want to diminish the piece that way. Michal's artwork looks great and I'm very excited about it. I've always been proud of this story. You don't have to be a fan of the old television show to get into this book but those who are will especially enjoy it. It really advances the classic arc of Lost in Space." "Lost in Space"® is a registered trademark of Space Productions. © Space Productions. Licensed by Synthesis Entertainment. All rights reserved. 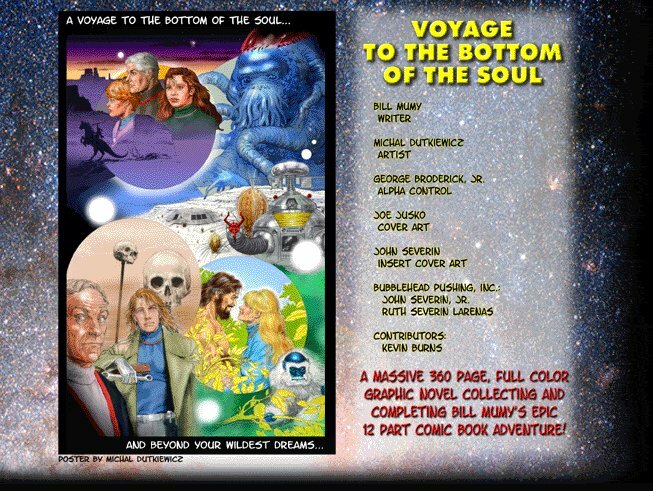 For additional information regarding Lost In Space: Voyage To The Bottom Of The Soul, contact Bubblehead Publishing at: gbstudios@comcast.net. Please include "LIS:Voyage" in the subject line. Unidentified e-mails will be deleted unopened.